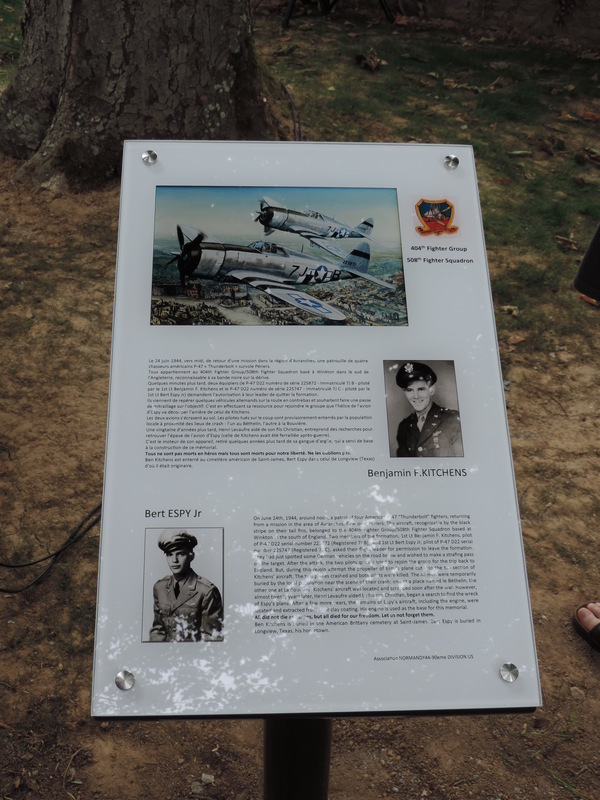 The unveiling of this new memorial dedicated to Lieutenants Ben Kitchens and Bert Espy, both American pilots of the 404th Fighter Group’s 508th Fighter Squadron, flying from Winkton Advanced Landing Ground on Saturday 24th June 1944, took place in Périers on 24th June 2017, exactly 73 years to the day, after the accident which took their young lives. The two pilots were killed following a mid-air collision, just after they had completed a strafing run on a German armoured column, near Periers. The memorial contains the armour plate from the pilot’s seat back, the engine and the propeller from Lt Espy’s P-47 Thunderbolt aircraft. 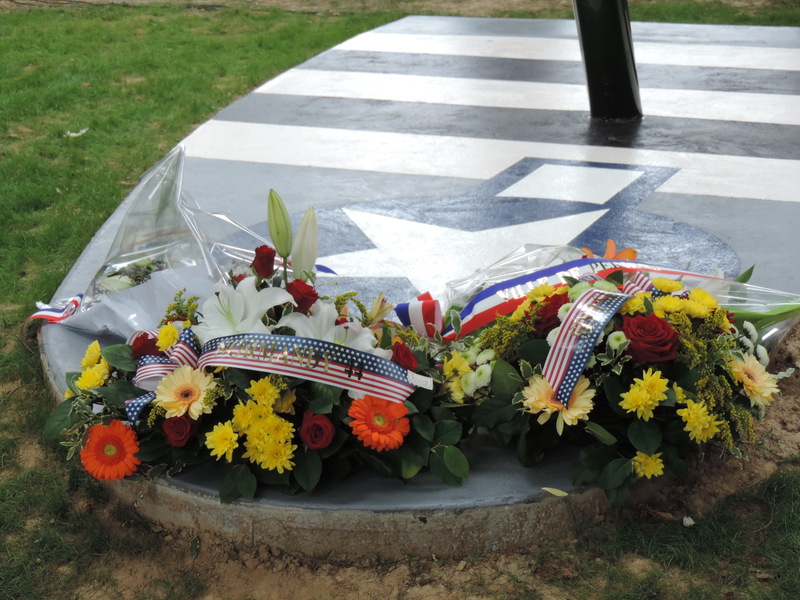 The base of the memorial is fashioned in the shape of a P-47 wing, with D-Day stripes and the blue and white star and bar US Air Force insignia. The memorial is the brainchild of Henri Levaufre and his then 12 year old son Christian, who were sheltering in a farm nearby, when the tail section of Lt Kitchens’ aircraft fell to earth after the collision, only thirty metres from the house. They found the burning remains of the rest of the aircraft towards le Béthelin, south west of Periers, with exploding ammunition and the pilot nearby. They buried his body in a temporary grave on the spot. The other aircraft fell less than a kilometer away, close by the road to Monsurvent. The remains of its pilot, Lt Bert Espy Jr, were buried by the same family in the garden of their farm, not far away from the spot of the crash. The wreck of Lt Espy’s plane was located again by Henri and Christian Levaufre in August 1966, half a mile to the south west of the farm. Espy’s aircraft had dived into the ground at a steep angle, with the engine being driven several metres into the ground. After confirming the site of the crash, they left it undisturbed until 1983. That year, the site happened to be designated as the location for a new waste disposal dump for the town. Henri Levaufre, then a city councillor, was determined that the aircraft should be recovered before this happened. Finding aluminium panels immediately on initiating a dig, they recovered much of the aircraft, locating the engine, which was buried four metres deep. 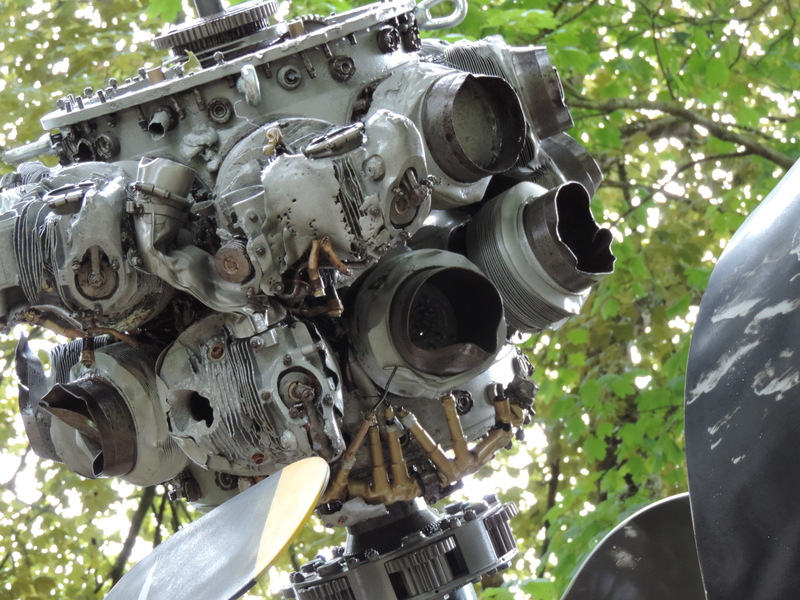 The engine was recovered and then kept in storage, before being recently renovated and specially treated, to allow it to be displayed as part of the new memorial. Since 2014, they have worked with many others in the town to make the memorial a reality. 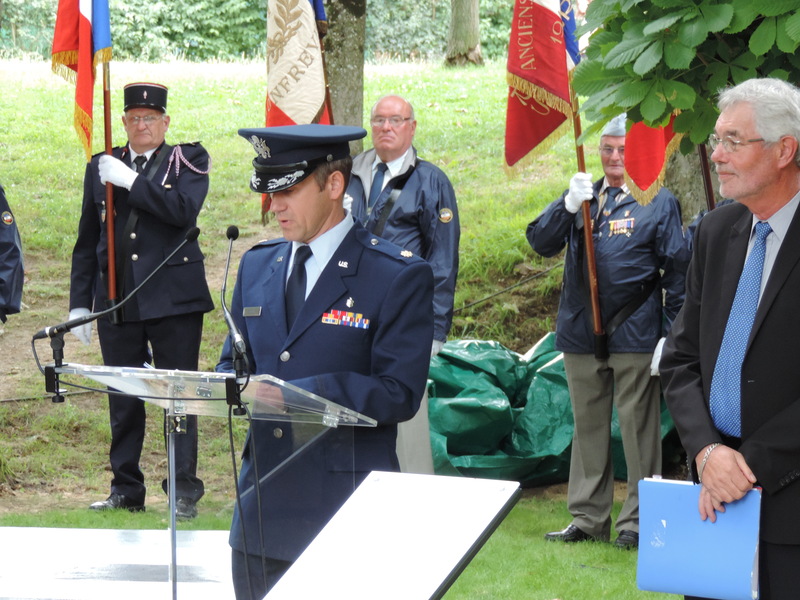 This tale of devotion and persistence, spread over half a century, demonstrates once again the deep gratitude and respect that the local people of Basse Normandie have for all the Allied servicemen and women; the soldiers, sailors and airmen, who strove to liberate them from four years of Nazi oppression and slavery in 1944. The kindness and reverence with which their sacrifice is still viewed today throughout this region of France is manifest. 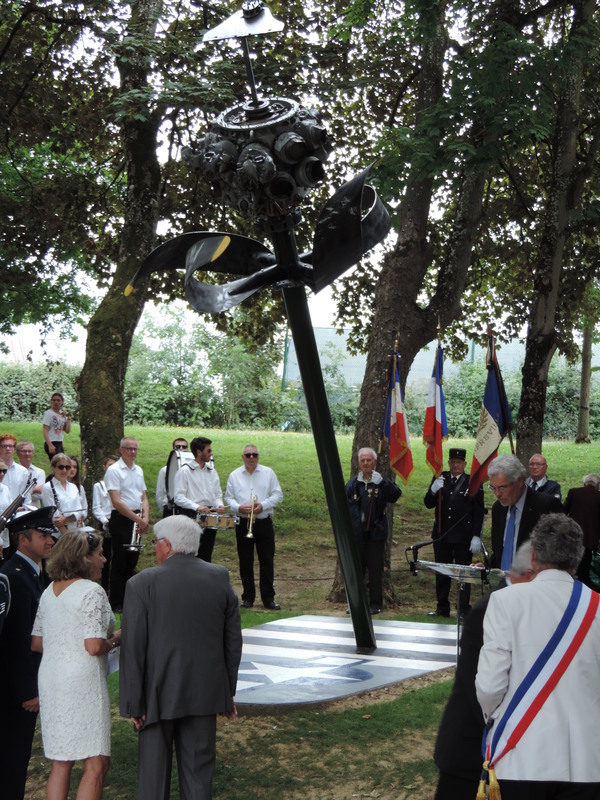 Young French children from the age of 4 or 5 are all encouraged to take part in local remembrance ceremonies, to lay flowers, in gratitude to and in memory of their young liberators, from over 70 years ago. Being occupied is different. For those of us who have not known enemy occupation, it is difficult to understand the full impact and meaning of their loss of freedom and how vital and joyous it was for them to regain it, once again. Their gratitude will continue long into the future, passed down to the generations to come, with reverence and honour. 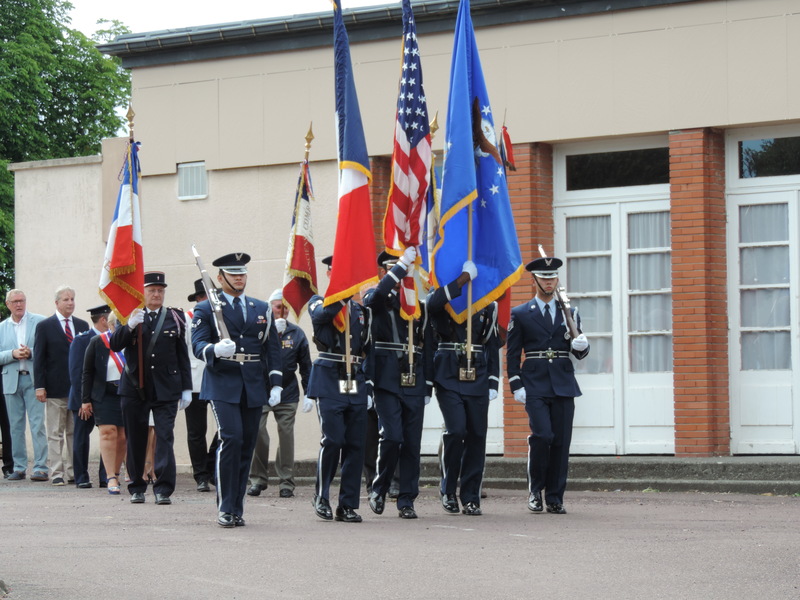 Lin Nancy Thurmond, Bert Espy‘s niece, and Major Jason Jarecke, a US Air Force officer representing the US embassy in Paris both gave addresses to the assembled company. 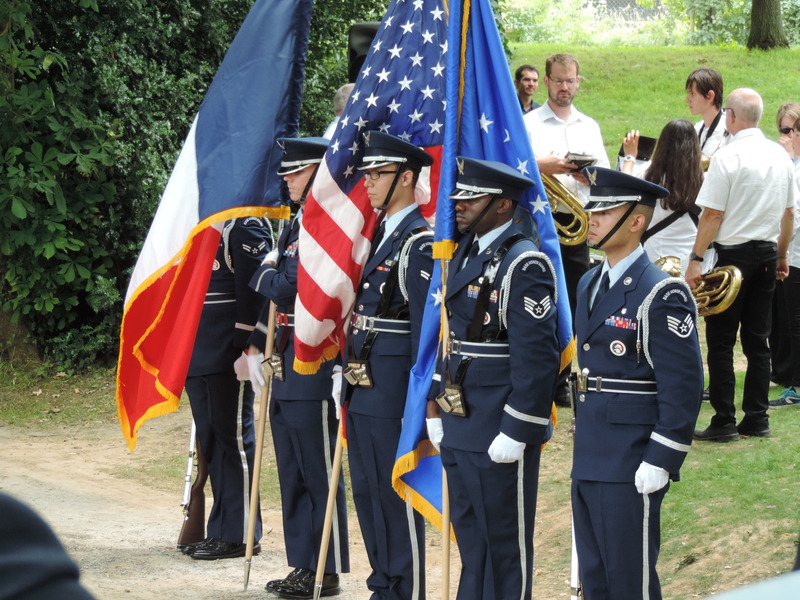 A local marching band and an United States Military Guard of Honor both attended the ceremony. 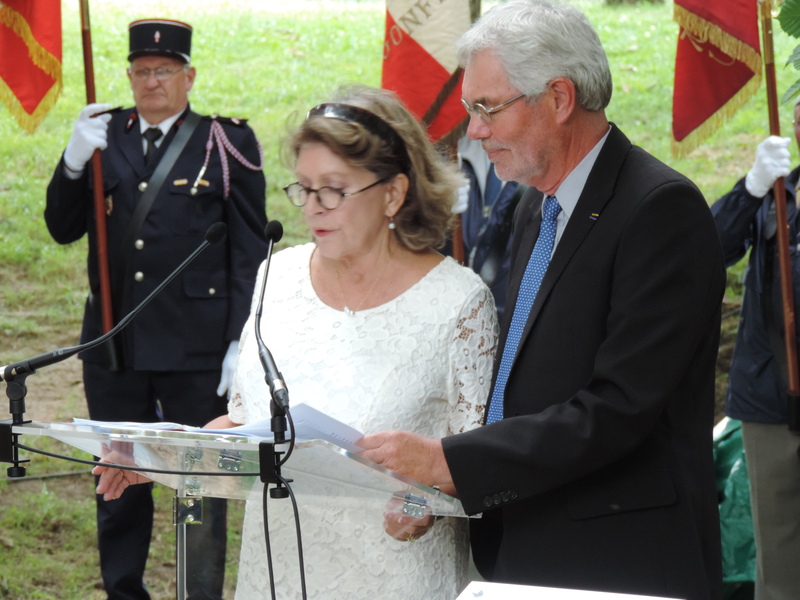 A transcript in English of the addresses given at the ceremony is attached below, together with photographs and a link to a French video record of the ceremony.